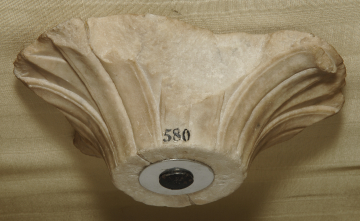 This fragment is the column-capital shaped top of the pedestal (schaftansatz) of a candelabrum or enriched shaft, ornamented with carved acanthus leaf-and-petal enrichment on the top outside, and stylised palm leaves on the cavetto1. 1 More examples of foliated 'shaft feet' in Hans-Ulrich Cain,Romische Marmorkandelaber, 1985, pl. 84, 1-6. Rome; collected in Rome by Charles Heathcote Tatham for the architect Henry Holland during the 1790s. See Cornelius Vermeule, unpublished catalogue of the Antiquities at Sir John Soane's Museum, Introduction, transcription of Tatham letters, List 3, no.18.